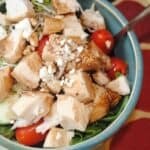 Do you need a new healthy salad recipe to add to the menu this week? 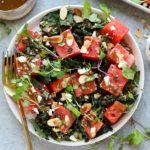 This grilled kale and watermelon salad is packed is flavor-packed and so refreshing. 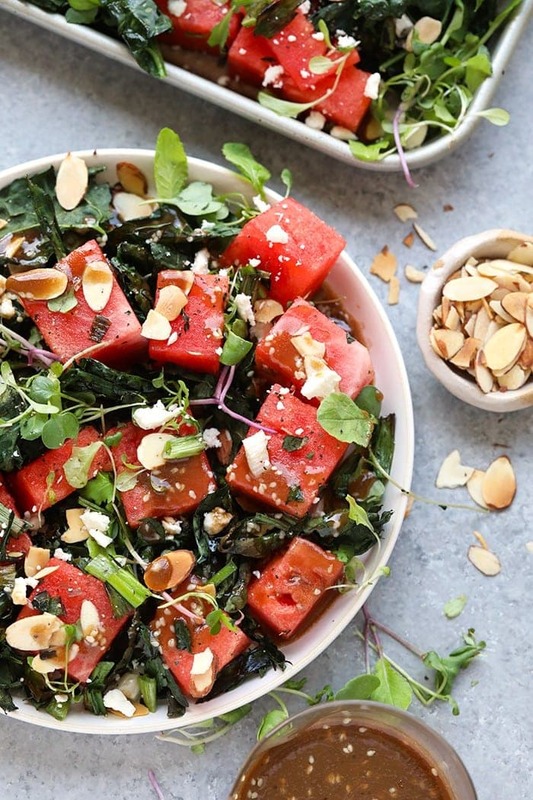 Throw some kale on the grill, cube up some watermelon, and dinner is served. 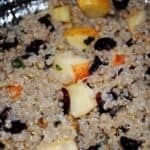 It’s easy and a great healthy lunch option for the week! I am all about the salads this summer. Nothing against romaine lettuce, but I needed something more. If you’ve been following @linleyshands on Instagram, you’ve been following my garden journey! We’ve got all of the greens a girl could ever ask for. Kale, arugula, lettuce mixes, collard greens, oo-oo I just can’t get enough. I can’t wait to share more with all of you about our garden in a couple weeks, I’m going to share ALL the details. 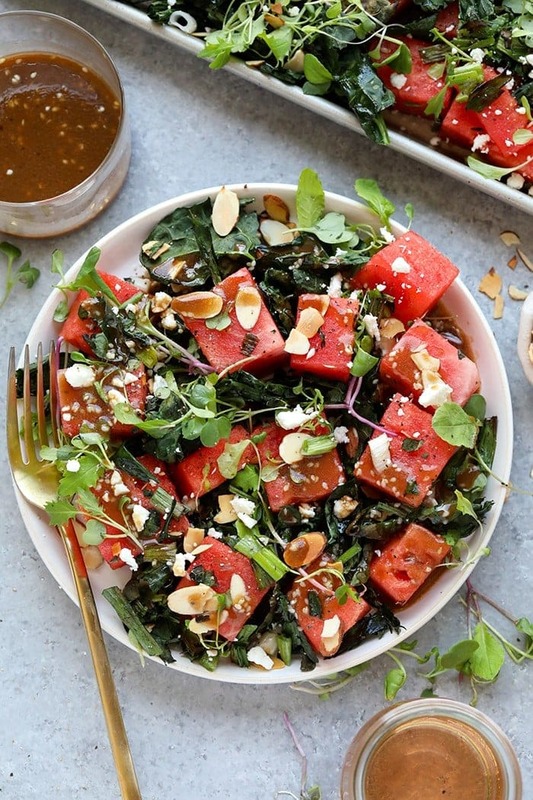 But first, this grilled kale and watermelon salad. 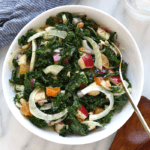 We have really been into kale salads over at Fit Foodie HQ. 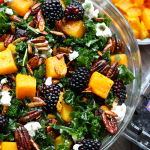 If you’re looking for some delicious massaged kale salad ideas, try our Massaged Kale and Fennel Salad or our Harvest Blackberry and Butternut Squash Massaged Kale Salad? They are out of this world good. Most of you know that my favorite food is arugula, but I will never say no to a massaged kale salad as long as it is dressed and has some kind of delicious cheese. 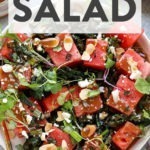 For this watermelon feta salad, we used Tuscan Kale, rather than curly kale. You can use any type of kale that your heart desires. 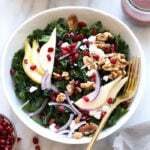 Since we’ve been pretty obsessed with massaged kale, I thought that changing it up and giving this salad a summer spin would be perfect. What screens summer more than the grill? All you have to do is throw the kale, green onions, and almonds on the grill for 15 minutes all together and your salad is almost ready! Before you ask, we did try to grill the watermelon. We were not fans. If you love grilled watermelon, more power to you! When we grilled the watermelon, it found it just tasted like it had sat in the sun for too long. We are also OBSESSED with warm + cold combinations for healthy salads, so everything worked out just as it was supposed to. 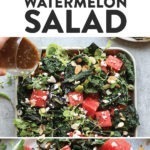 Now, pour yourself you’re favorite summer drink (perhaps it’s this healthy homemade lemonade or this refreshing Frose) and start making this tasty watermelon salad. GET GRILLING. Preheat grill to 350ºF and make sure your grill grate is clean. Next, make a small tin foil boat and place your almonds in the tin foil. 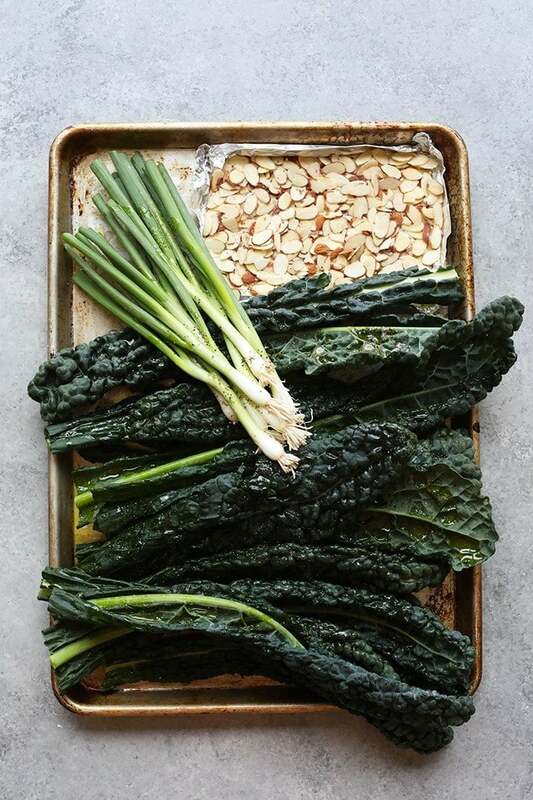 Prep kale (keep on the stalk) and green onions by placing them on a cookie sheet and drizzling them with olive oil and seasoning with salt and pepper. Place kale stalks and green onion on direct heat on the grill. Place the tin foil boat with the slivered almonds in it on indirect heat on the grill. Cover grill and let cook for 5 minutes. After 5 minutes, flip green onions and stir almonds. ** Place the cover back on the grill for another 5 minutes. Prepare the dressing while vegetables are cooking on the grill by placing all ingredients for the dressing in a mason jar. Cover and shake until ingredients are well combined. Remove green onions and almonds from the grill and set aside. Prepare watermelon by cutting off the rind and then cutting into cubes. Debone kale and chop and slice green onions. Then, mix kale, green onions, almonds, microgreens, and watermelon together in a large bowl or on a baking sheet. Add dressing right before you plan to eat and enjoy! You want the kale to be golden brown at the tips but not super crispy. If kale is still wilty keep it on the grill for an additional 2-3 minutes. If you don’t have pomegranate juice, use any darker fruit juice that you have such as a berry choice, cherry juice, etc.